What is Joring? It is a Swedish word meaning ‘driving or pulling’. Most Dog Joring sports involve dogs doing the pulling but in the case of skijoring, horses are often involved for some really high speed Joring!. There are many dog Joring activities involving dogs in harness. Some are winter Joring sports, you would need snow for those and others that could be done on any reasonably smooth surface. Many in North America call the Joring activities that do not involve snow, dryland or urban mushing. I am including CaniCross under Joring here, which does not involve pulling a device with you on it, but rather both you and your dog running. Note– Joring on concrete or asphalt should be avoided for very intense workouts. A dogs paws just are not created to run on those kind of surfaces for long without damaging their paws. If you do plan on running on rough surfaces, teach your dog to accept and run in dog shoes for dogs made for that purpose. Never run your dog on hot concrete or asphalt even with boots, if the surface is hot enough to cook an egg, it’s hot enough to shred and burn your dog’s paws! All of the Joring sports require the dog to wear a harness to pull effectively and comfortably. There are basically 4 types of dog harnesses. 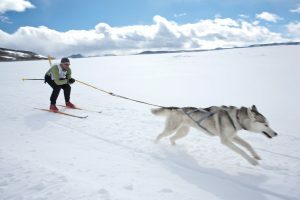 Harness styles used are the following 4 styles: Cross-back (x-back), the H Back, the Halfback, and the Wheel dog harness (pulling kicksleds and larger team dog sleds). The Cross-back (x-back) is used for Canicross, Bike-joring, Scootering, Cross country skatejoring, Mountain Board Joring, Skijoring and Kicksledding. This harness is designed with the straps ‘crossed’ on the dogs’ back ending at the tail. The tether is attached at it’s tail end. The H Back is better for long lean dogs. This harness has been made for dogs that need more support over the back and to help dogs find the right pulling direction, as it relieves any pressure over the back. The H back is used like the Cross Back harness in all the Joring sports. Also used as a harness for dogs going through rehabilitation after an injury. The Half back harness is used for Canicross, Bikejoring, Scootering, Cross country skatejoring, Mountain Board Joring and Skijoring. Its a shorter harness particularily suited for small dogs or very deep chested dogs. It looks like the harnesses used for leashed walks but it is designed to pull some weight. The tether attaches to the top middle part of the dogs back. This harness is not suitable for kicksledding. The wheel dog harness would be used for kicksledding (for the dog right in front of the sled) because this harness would not put pressure on the dog’s hind. If you were using 2 or more dogs in front of the ‘wheel dog’, they would be using the Crossback Harness in most cases. All of the above are the traditional harnesses used over the centuries. For a new design, check out the Ruffwear Joring system. 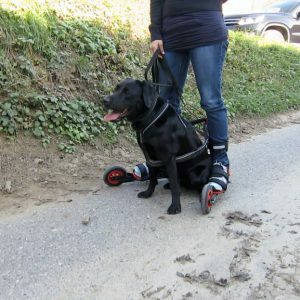 The system works exceptionally well as a dog scooter harness but equally well with biking, mountain boarding,snowboarding and skiing. It is not recommended for heavier pulling as in pulling a sled. The Ruffwear Joring system comes with the tethers, dog harness, and waist harness for the human too. The new Joring style is quick and easy to put on, and looks great, however, there are more plastic snaps involved. This system is also a lot more expensive to purchase than the older styles above. The older styles, particularly the Cross Back harness, has no snaps or buckles to break. I own a Cross Back for my largest dog and it works well. I originally purchased my harness for my late Husky and the same harness on my Collie X falls a little short along his back. All harnesses regardless of the type, should be sized according to the size of the dog. Kurgo has a Joring harness that you might want to check out. They also have a wide variety of supplies that you might need when travelling with your dog or having outdoor adventures. Here’s an example of competitive Joring…. Feel the Rush!!! Dog Joring Sports are great exercise! Training for Joring is not difficult but you must start with a healthy and reasonably fit dog. I don’t recommend having a young dog under a year doing any pulling. The bones are still too soft and most of the larger breeds are not finished growing until they are close to 2 years old. Obviously, if you have a miniature breed, you cannot expect your dog to pull you. With the use of a tether attached to a harness around your waist to your dog who is also wearing an appropriate harness, your dog will be moving ahead of you. 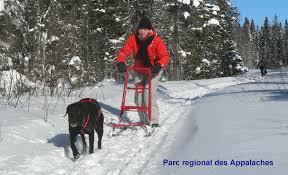 Canicross can be done in any season. 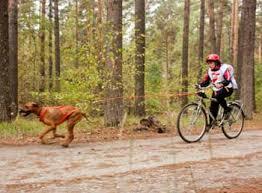 Canicross is different from simply walking or running with your dog tethered to your waist. 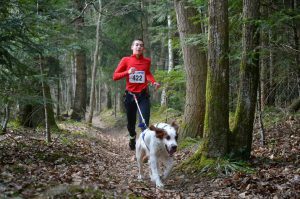 Canicross requires your dog to be trained to move ahead of you on a snug tether to give you some support in walking or running in more difficult terrain such as hills. Canicross is a great activity to teach your dog commands to move forward into more challenging sports like skijoring or boardjoring etc. Canicross, like all the other Joring type dog sports, requires the dog to be trained to slow, stop and turn at your bidding. With the use of tether, harness, and adapters to attach to your bike, your dog or dogs will be running ahead of you. Your dogs will be trained to pull, keeping the tether tight, you will be helping along by pedaling, depending on terrain and how fast you need or want to go. You on your bike can most certainly go faster and longer than your dog on a ideal surface, however trained tethered dogs can help you up slopes and rougher terrain as in mountainbiking. 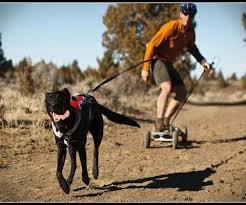 Bikejoring is not the same as someone exercising their dog on leash using their bike. In that case, the dog is running alongside and is not adding to the biker’s efforts. The skijoring equipment needed for skijoring with dogs, would be the same as in the other joring sports, harness for the dog, tether, and waist harness for you. You will be skiing behind, helping with your own skiing skills and pushing off with your poles. It is necessary for you to have the appropriate harness as well, leaving your hands and arms free to use your ski poles. It’s important to note that in skijoring, you will be doing cross country sking, not downhill sking! Naturally you will need to teach your dog basic commands used in all dog Joring sports. To learn the ins and outs of Skijoring, the book called Skijor with your dog (Dog Product reviews page) is highly recommended. 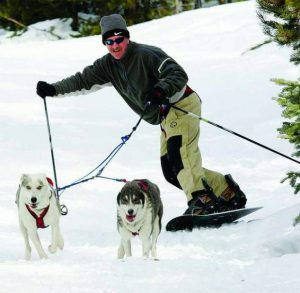 As in Skijoring, using a tether attached from your own waist harness to your dog’s body harness, using a regular snowboard. You would be snowboarding BEHIND your dog on a snug tether. Snow boardjoring with your dog would be done on a smooth snowy surface, not too hilly, only using gentle slopes that your dog could handle. You don’t want to be snowboarding ahead or on top of your dog, that defeats the purpose of having your dog pull you! It’s important to teach your dog basic commands used in all dog Joring sports. Make sure to teach your dog the basics like stopping, turning, speeding up and slowing down for both your safety. Mountain Boardjoring is the same as using a skate board behind your dog, except that a Mountain Board is designed for rougher terrain. A skateboard would only be used on a smooth surface like sidewalk or paved street. There is a lot more control with a Mountain Board, as some of the ones I have seen have large inflated wheels and even handheld brakes. As in skijoring, you would be wearing a waist harness attached with a tether to your dog’s harness. Some enthusiasts however, prefer to hold onto the tether instead of having it tethered to their waist. Of course your dog needs to learn the command basics like stopping, turning, speeding up and slowing down for both your safety. The following example shows two dogs with exemplary training as the dog owner is holding onto the hand brake for the skateboard with one hand and the other hand is holding a camera on a telescoping pole! Some call this Cross Country Roller skating but it is a Nordic sport, originating from the Nordic countries like Sweden and Norway. Most enthusiasts seem to refer to this type of skate as a Nordic Cross (X) skate. This type of skating is starting to catch on in North America as well. One particular brand is called Skike. This rollerski, is made in Germany but is now available through Amazon (note it is unavailable from time to time). There are many different types, some look more like a jazzed up roller blade but the true Nordic X is meant to be used instead of skis so they are longer than a regular roller blade. Like the Mountain Board, the Nordic X skate, can be used on a rougher surface. The Skike can be used on packed gravel, close cropped grass, packed dirt as well as asphalt and concrete. The Joring part ,of course, is where you and your dog are tethered together harness to harness. Kicksledding or kick sledjoring as you see by the photo, involves a small light sled being pulled by a dog. Most kicksleds have a seat at the front for a child or a backpack of supplies. The kick sleds with a seat look like a chair on skis. Less popular are the kicksleds with no seat. It’s called a kick sled because the person in control of it can use their own propulsion by pushing with alternating legs/feet. A kick sled can be used on ice or hard packed snow without a dog pulling it. They are light and balanced, easily pushed by one person, adult or child. However, attach your dog or dogs, with a tether, and it’s a whole lot more fun! The kicksleds construction vary from traditional wood to light metals. I found some nice traditional kick sleds on Ebay Kicksleds These Kicksleds are from Montreal, Quebec, Canada and ship from this supplier for FREE in Canada and to the USA. They still ship internationally but the shipping is not Free for other countries. A kick sled dog needs to learn the commands for stopping, turning, speeding up and slowing down etc., before hitching your dog up to your kick sled. In my opinion, everyone that has a snowy/icy winter where you live, should have a Kick sled or two, even if you don’t have a dog to pull it! It’s a whole lotta fun! Just for fun reading, I recently found this book called Winterdance ( Dog Product reviews page) Not a new book, Winterdance was written in 1994 but the author is well known. This book has high ratings, almost 5 stars from 111 readers! Readers describe this book as humourous and easy to read by all. “Whoa” or “Stop” – self explanatory, one of the most important commands! as long as you are CONSISTANT and the words should not be words that are used often in common conversation. Words like Okay to get going as a command should be avoided. You would be surprised how quickly a well trained Joring or Sledding dog would respond to that command if he or she heard it in a conversation nearby and you were not ready! I recently wrote a post on training your dog for Joring that you may want to read. Check it out here at Dog Joring in the Snow. Dry land sledding is the same as the kick sledding or team dog sledding except that it’s done with wheeled carts. Obviously, if there is no snow, you can’t sled with the normal snow sleds, right? Some of you may live in areas where you never get any snow, while others have to wait until winter to snow sled with our dogs. The video below shows you a three day event held in Wales, UK. The event required the contestants to Bikejor, Canicross and using teams, Dry Land sledding. The video is about 16 minutes long, but worth watching. I admit videos like this make me cry (just a bit), with joy for all the participants, dog and human! I’d LOVE to be there! I really don’t know if getting your dog to pull you is a good idea. However, since joring is an approved sport in some developed lands, it guess it’s ok. Thanks for giving a heads up regarding the age and fitness of a dog to be used for joring. I love the youtube videos you shared. They gave me an idea of the sport as well as the various types of harnesses available. But my question is: “Does the dog benefit from the exercise as much as the owner? Hi Phranell, thanks for checking in here. I’m glad I was able to enlighten you about the sport of Joring. As far as pulling goes, one dog really cannot completely pull an adult human weight for very long, two dogs are better and they would have to be fit and at least of medium size. If you take a closer look at the dogs in the videos, note how excited they are! These dogs Love it! A dog that does not love it, will not pull. It’s that simple.